[S1240] Germany Marriages, 1558-1929, online FamilySearch.org, FamilySearch.org, Blum-Etten Marriage, Katholische Kirche Walsdorf, Bamberg, Bayern, Germany, MF#559037, accessed October 15, 2010. Death*: He died on 5 April 1899 at Chicago, Cook, Illinois, USA, at age 15. KILEY - ALEC, only son of Kate Kiley (nee Kinney) and the late P. J. Kiley. Funeral Friday, April 7, from 401 S. Robey st., 9:30 a.m., by carriages to Calvary. [S1836] Patrick Kiley (first burial in plot) Cemetery record, Calvary Cemetery, Evanston, Cook County, Illinois, USA, Alexander Kiley, age 15. [S779] Illinois Statewide Death Index (Pre-1916), Alexander Kiley entry, April 5, 1899, no. 10088, accessed October 4, 2013. Death*: He died on 23 March 1893 at Chicago, Cook, Illinois, USA. KILEY - At 425 S. Robey st., March 23, PATRICK J., husband of Katie Kiley aged 39 years. Funeral Sunday by carriages to Union depot, thence by cars to Calvary. Chicago Daily News, March 25, 1893, page 7. DEAD WITH HIS FACE TO THE FLOOR. Suffocation Alleged to Be the Cause of P. J. Kiley's Peculiar Death. P. J. Kiley, employed in the election Commissioners' office, who lives at No. 425 South Robey street, went home last night at 8 o'clock under the influence of liquor. His wife refused him admittance. Shortly before midnight he was found dead, lying face down in the barn in the rear of the premises, by Patrick Feeney [sic], his father-in-law. Dr. Brown said death was caused by suffocation. [S1904] Brittney Reyes, "hi," e-mail to Elaine Beaudoin, March 24, 2014. [S1836] Patrick Kiley (first burial in plot) Cemetery record, Calvary Cemetery, Evanston, Cook County, Illinois, USA. [S779] Illinois Statewide Death Index (Pre-1916), P. J. Kiley entry, March 23, 1893, no. 9709, accessed October 4, 2013. [S775] Interview, Bruce Stewart, October 25, 2007. [S769] William Sullivan, September 30, 2007 One World Tree download , Kathryn Kirby entry. [S1879] Cecile Morris entry, Wisconsin, Milwaukee County, Milwaukee #01666, Pre-1907 Wisconsin Birth Records, Milwaukee County, reel 199 (Registration date: December 16, 1901). [S771] 1900 US Census, Wisconsin, Milwaukee County, Milwaukee City, Washington, DC, ED 152, Page 2A, Ancestry.com; Accessed October 1, 2007. [S1324] Chicago Tribune, July 26, 1956, page C2, ProQuest Historical Newspapers, accessed February, 2011. [S945] Facebook, online www.facebook.com, Peggy Janish posted on March 25, 2015 on her Facebook page that Jimmy Kissane had died. [S2166] James and Margaret (Woods) Kissane Cemetery marker, Mt. Carmel Cemetery, Hillside, Cook County, Illinois, USA, Image posted on Facebook by Annette Malone, June 24, 2015. [S1002] U. S. Social Security Administration, James Kissane entry, accessed January 7, 2015. [S1933] Illinois, Cook County Birth Certificates, 1871-1940, Index, online www.familysearch.org, Michael Emmett Kissane birth record, April 22, 1936, Chicago, Cook, Illinois. Certificate number 14085 Registration date: April 29, 1936. [S1327] Carleen Malone, "Confused on Anna vs Marguerite," e-mail to Elaine Beaudoin, April 13, 2011. 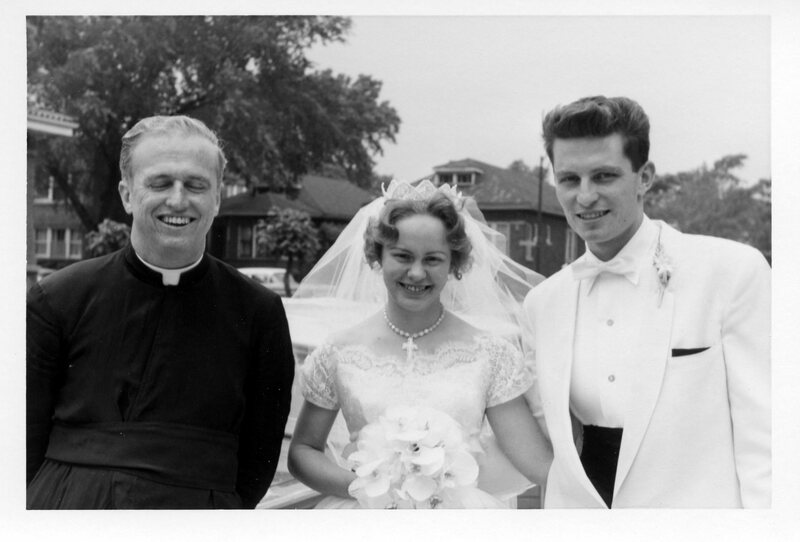 Biography*: A Tribute to Michael E. Kissane by his nephew Louie. Posted on Facebook by Maddi Morelli, June 24, 2017. My Uncle Mickey was pretty near a perfect man. He was so thoughtful and caring to all, especially to me and my family. It's hard to image going forward without him. We were so blessed to have him in our lives. He treated me and my kids as if we were his own children. He spread love and laughter where ever he went and made life long friends along the way. Throughout my entire life, my Uncle has had a major influence on me. I'd look at him and marvel at how he always had a smile on his face and could make everyone around him feel better. He would never lecture or reprimand anyone, but he lead by example. I can honestly say, I've never heard him say anything bad about anyone and he never complained. If you had a problem, he was more than willing to help. If you needed to vent, he was a patient listener. If you needed someone to cheer you up? Mickey was your guy. He was never jealous, in fact, he was genuinely happy for those who found good fortune. He would give you the shirt off his back if he thought you needed it. One example of his selflessness was when he made a loan to my dad to help him start his company when no else would. He made him that loan even though it was all he had in his savings. Yet, he gave that loan willingly and without any expectation of repayment. That loan was so critical to the success of my Dad's business that he never forgot Mickey's generosity and praised Mickey until the day he passed. Mickey was not just a very handsome, generous and kind man. He was also extremely talented. He was a gifted artist and incredibly creative. He could paint and draw wonderfully. He always had a unique and clever art and craft project going on. Mickey's smile and endearing personality lit up every room he ever walked into. I'm sure we all agree, Mickey had a special ability to make you smile and laugh. He was always ready to share a good joke. I've never met anyone who knew as many jokes as he did. One better then the next. His joyful, kind, encouraging, and charismatic personality made my Uncle everyone's favorite. Mickey brought out the best in all of us. Most importantly, he showed us how to enjoy life and how to treat one another. He knew that true happiness is not how much you accumulate along the way, but how much love you spread. Mickey mastered the art of spreading love. Thank you uncle Mickey for bringing so much love and happiness to me and my family. You have inspired and influenced so many of us with your beautiful and heartfelt love. [S2496] Conboy-Westchester Funeral Home, June 21, 2017, On-line via Legacy.com. [S945] Facebook, online www.facebook.com, Post by Maddi Morelli on her page, June 24, 2017. Vernamae E. Platt, 76, of North Port, Florida, died on Sept. 16, 2017. Visitation will be held from 5:00 PM to 7:00 PM on Friday, September 29, 2017, at Farley Funeral Home, 5900 S. Biscayne Drive in North Port. Services will be held at 10:00 AM on Saturday, September 30, 2017 at San Pedro Catholic Church, 14380 Tamiami Trail in North Port. Burial to follow at Restlawn Memorial Gardens in Port Charlotte. Funeral arrangements by: Farley Funeral Home in North Port (www.farleyfuneralhome.com.). [S1978] Ancestry.com Family Trees, online www.ancestry.com, Fred Elliott Family Tree, created by brokerfred, Lehigh Acres, Florida. Accessed April 9, 2018. [S2195] Cook County, Illinois Marriage Index, 1930-1960, online www.Ancestry.com, Robert T. Elliott and Vernamae Klein, 11 Jun 1960, file number 2570708. [S1261] Niederehe-Knappstein Illinois Marriage Certificate: FamilySearch.org, Illinois, Cook County Marriages, 1871-1920, no. 102496. 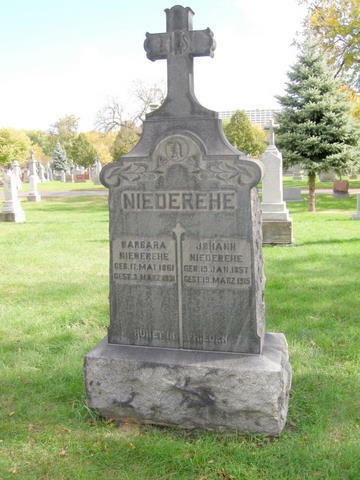 [S1262] Johann and Barbara Niederehe Cemetery grave stone, St. Boniface Cemetery, Chicago, Illinois.